Colorado is quickly turning into a number one spot to explore, indulge and enjoy your cannabis vacation but that is not only because of the legalization of the herb for recreational purposes. The stunning landscapes, especially in the appealing warm weather, are sure to bring your marijuana experience to whole new levels! If you are on the search for the best spots where you can spark your joint and sink into the mind-blowing beauty of Colorado, then keep reading and you’ll be one step closer to having the cannabis trip of a lifetime! 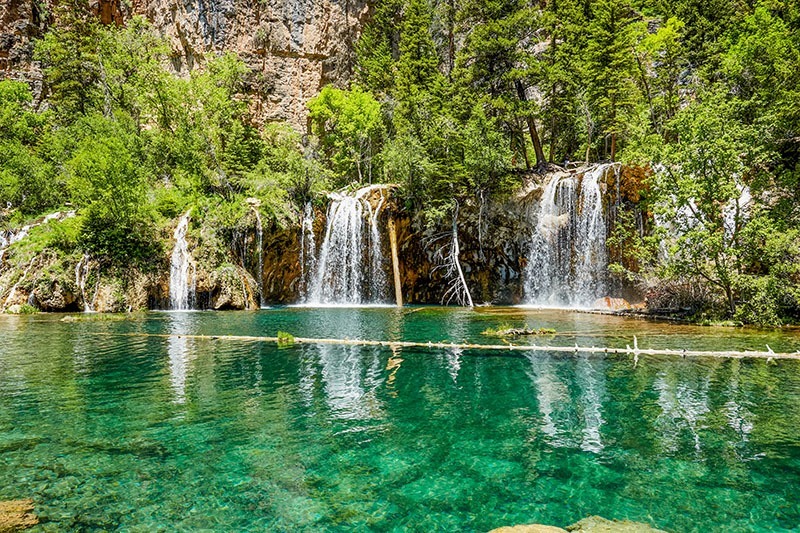 Titled as one of the most beautiful lakes in all of Colorado, the Hanging Lake lives up to its fame. Offering visitors numerous spectacular views to light a joint, this lake is simply mind-blowing. This legendary and stunning lake is located only 3 hours away from Denver, and the hike is even well-suited for beginners. There is simply no other place where you can literally soak in serenity, as the lake seems to be hanging mid-air taking you are out of this world and into a fairy tale. Undoubtedly, the Red Rocks Park is one of the most (if not the most!) visited destinations. In fact, it is very hard to rank it second, however, the entire list of must-visit cannabis spots in Colorado can be re-arranged according to your personal preferences. Great for fans of hiking, horse riding and biking, the spectacular views can be enjoyed in multiple ways, and both novice and more experienced hikers will find plenty to smile about. St. Mary’s Glacier is a favorite spot for both passionate hikers as well as people who prefer more moderate, easy and quick trails, as you can choose to enjoy the view your way. Those who are eager to challenge themselves with some more hiking up the rocks can take the longer way to explore the terrain. Meanwhile, even if you are not interested in spending your day climbing high altitudes, you can still indulge in the breath-taking view nestled in the heart of the forest without too much effort. Strawberry Park Hot Springs is your best choice if you are not a fan of physically-challenging activities. The hike is a very leisurely one to experience, and it is open to the public the whole year. Plan some time to sit back and relax in the therapeutic hot springs, which will make you forget about pains and aches. Meanwhile, smoking a joint in the middle of that little paradise is sure to boost your experience and turn it into an unforgettable mini-celebration for the senses! The 4.9-mile trail of the Crags is an ideal start to spending a beautiful day in nature, without costing you too much energy or efforts. With the astonishing forest areas, slowly revealing themselves right in front of your eyes, there is plenty of little secret cozy spots to enjoy a hit of your favorite strain and sink into the one-of-a-kind harmony of the area! In order to arrive at the Bear Creek Falls, you can either use your own legs or bicycle to conquer the pretty moderate 2-mile hike. However, the scenery that you are about to experience is anything but moderate, colored in bright green by the surrounding forests a perfect place to enjoy one of the most amazing hike days ever! If there is a single place in North America which has become most famous worldwide due to the breathtaking photos of its enthusiasts, then it is definitely Maroon Bells, also known as Maroon Lake. The twin peaks will spark the light of your deepest fantasies as the sun bathes the mountains in stunning colors, which almost appear surreal. Just make sure to check for availability before you visit this out-of-this-world view, as there are certain restrictions due to the massive popularity of the spot. In the case that your heart aches for exploring the wisdom of time and eternity, then there is no better place to do that than Rattlesnake Canyon Arch Trail. In fact, this is where your Instagram-hungry soul can generate tons of likes, as the almost extraterrestrial view of this impressive 1 023 acres is worth getting a photoshoot! It took thousands of years for Mother Nature, as well as tons of wind and sand to create this vivid view. Thus, it is a brilliant idea to dedicate your entire day to roaming the vast area, letting your soul free of any negative vibes and emotions. This place simply wipes them all away in the blink of an eye! When you plan on merging your favorite green medication with spectacular views and some precious time spent in nature, there is simply no better place than Colorado! One thing that you need to be ready to face is that your entire being will want to go back again and again to experience that ultimate serenity, where time shows its magnificence and glory. Don’t be afraid to run out of breath once in a while, as the spectacular views capture your heart and mind for eternity.